Reddit is a text-based forum, but discussion can fall to images. Today those come largely from Imgur (pronounced "image-er"), which is home to some of the internet’s most popular memes, such as socially awkward penguin, success kid, rage face and many more. While independent, Reddit and Imgur fuel off each other. But while Reddit has struggled to define what it is to advertisers — and some are wary of adding it to their repertoire — Imgur is marking 2015 as its grand entry into marketing. Back in 2009, the young coder-now Imgur CEO Schaaf was speaking to fanatical internet consumers. 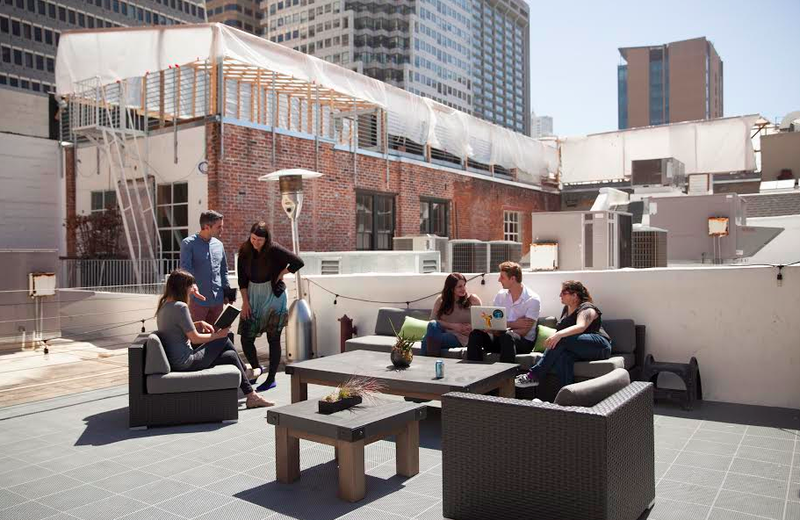 These days he finds himself, along with a team of 65 based in San Francisco, talking to billion-dollar brands. EBay, Sony, Warner Bros., Universal Pictures and Starz have all launched campaigns on Imgur, created with the voice and the humor of the site in mind, what some would call "native" ads, since Imgur started testing them six months ago. While social networks are still a "small slice" of eBay's "marketing pie," Argerich says it has been devoting more to social, and with that, branded content on Imgur. 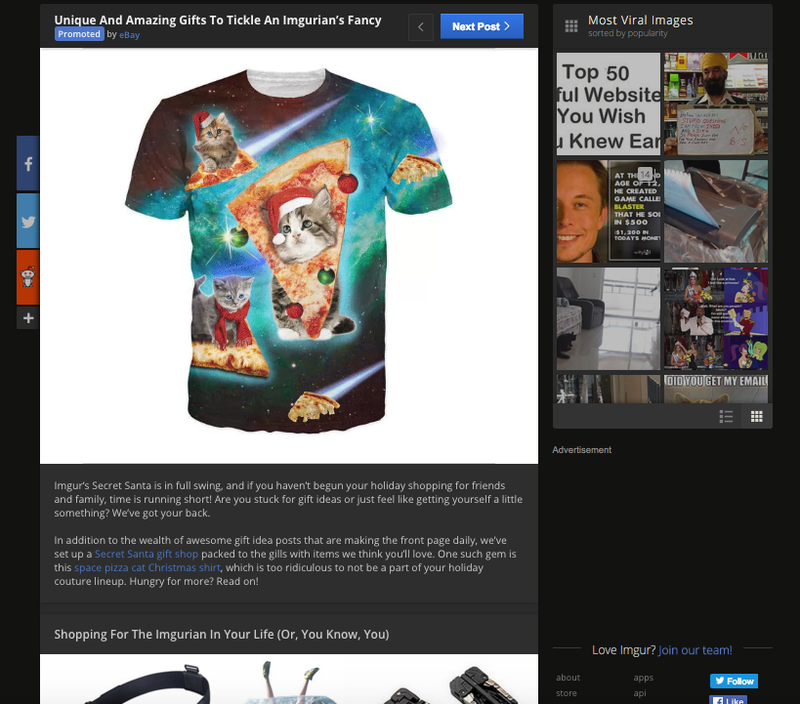 Since June, eBay has run 23 ads, called promoted posts, on Imgur. The site has also paid for ads on Reddit. Starz did a campaign for the TV series "Blunt Talk," starring Patrick Stewart. "The first three posts performed so well that we ended up doing an incremental fourth post," said Alison Hoffman, executive vice president of marketing for Starz. Those ads, among the just over 60 campaigns on Imgur, have been followed by Old Spice, PlayStation, MTV and Funyuns. Heading into 2016, Imgur and its partners are ramping up efforts with online advertising in part by focusing on sponsored content. "For marketers wondering what the next Pinterest or Snapchat is that’s worth paying attention to in 2016, Imgur’s one of the safer bets," said David Berkowitz, chief marketing officer at MRY, a global advertising agency. For an image-hosting startup created for Redditors, Imgur has built a substantal audience all its own. The service has 150 million unique visitors and is now the top U.S. website for men aged 18-34, according to analytics firm comScore, overtaking Facebook, Twitter and Twitch. Those men are notoriously hard to reach through traditional media and TV, making Imgur more tantalizing to brands looking to connect through humorous content. "As it turns out, there’s a tried-and-true semblance of a business model for all things that have a ton of content on it; that’s facilitating discovery," said Ian Schafer, CEO of marketing agency Deep Focus. For brands, Imgur's push aligns with the growth of social media marketing as well as in native advertising. Spending on social media is expected to reach nearly $10 billion in 2015 in the U.S., up 31 percent year over year, according to eMarketer. Sponsored content is expected to jump from $1.3 to $2.0 billion in 2016, BI Intelligence estimated. For all its size, advertisers are still struggling to figure out what, exactly, it is and whether it makes sense to create content specifically for Imgur. "It's an image platform. It's a community platform. The more you can connect, that's how you're going to monetize," said Tom Edwards, chief digital officer of agency business for marketing company Epsilon. "My question to this approach is, Is that it? It's a good start, but do they have the ability to scale?" Imgur's new advertising efforts are led by Steve Patrizi, formerly the marketing manager of Pinterest and LinkedIn. He joined in October 2014, a few months after Imgur's $40 million fundraising round with Andreessen Horowitz, the same venture capital firm behind Facebook and Twitter. When Patrizi started talking with Imgur in July, the company had only 15 people. Now, Patrizi and his team work with companies to create ads, a process that includes finding gifs and memes and even making direct references to Imgur jokes. EBay has done about one post a week on Imgur, and each execution has taken about a week’s time. Building and supporting original content is a big investment, which is why some social networks have launched their own ad teams to help brands aboard. But those efforts have been mixed: Snapchat recently decided to lay off several in-house content creators, but it still supports an affiliated agency called Truffle Pig. News organizations have placed their bets on building internal studios. In an age of ad blockers, brands are looking for ways to be a desired part of the content rather than an interruption, much like the fashion ads in Vogue. But Imgur has to also be careful that advertising doesn't turn off users. “One misstep and the community could backlash,” said Dillon Baker, associate editor at Contently, a content marketing company, and a former Imgur user. For eBay, tapping Imgur was initially a gamble. “Our leadership team wanted us to push the envelope, innovate and wanted us to have a millennial audience,” said Argerich. The shift was part of eBay’s larger corporate strategy to grow traffic. The first ad, titled "The Ultimate High Flying Father's Day Gift," shared pictures and gifs of drones and credited the footage to Imgur user joped. The upvote and downvote system, a function that lets users control and make it publicly known how a submission performs, also caught eBay’s attention. That interest came even as other advertisers experienced negative results with Reddit’s similar setup; their paid ads were heavily downvoted. Warner Bros., Imgur’s first partner for promoted posts, faced such backlash, according to Mic, which spotted the removal of the company's ads. Warner Bros. declined to comment for this article. As a forum of user-generated content where, unlike Facebook and Twitter, users do not use their real names and instead opt for screen names, and where swearing is frequent, Imgur can be a difficult land to navigate. "For brands that can handle a little bit of free expression, though, this will be a great site to consider in the coming year if they’re not there already," Berkowitz said. Starz teamed up with Imgur to promote "Blunt Talk," where the premium TV network said the show's theme aligned well with the community. "We wanted to capitalize on Patrick Stewart's internet fandom to generate interest among a male audience who knew him from his roles in Star Trek and X-Men," Hoffman of Starz wrote in an email. "Patrick is also the star of many of the web's most familiar memes and GIFs, making the male-skewing, GIF-loving, meme-creating audience of Imgur a natural fit." Several of the participating brands fit well with Imgur’s male-dominated demographic. Yet, interestingly, the 30 percent of Imgur’s active userbase that have identified as female are not all deterred. “I'm a girl but I'll be buying your product anyhow because I love this so much,” user knickerlicker wrote to Old Spice. Imgur certainly has competition in native advertising from the likes of BuzzFeed and even the New York Times, but unlike those companies, Imgur has no specific editorial mission or reason for being, other than to service Reddit users and now its own community. "I think they need to become more of a brand name," Schafer said. "They need to be top of mind with consumers and that will help them be top of mind with advertisers." Like all emerging ad platforms, Imgur will need to show results if they expect to move beyond experimental advertising budgets. "Imgur will need to further strengthen its data and targeting capabilities and diversify the type of ad products," said Orli LeWinter, vice president of strategy and social marketing at 360i, a digital marketing agency.